Interviewer’s Note: Mitch Mitchell is a Florida based wrestler who been wrestling for NWA Signature Pro Wrestling (NWA SPW) since 2012. NWA SPW was formerly known as NWA Florida Underground (NWA FU) and in the promotion Mitchell has enjoyed plenty of success in particular in his team with Jeff Boom. Known as Generation Genesis the duo captured the NWA FU Tag Team Championship in April 2014 and held the straps for 168 days. Mitchell has also wrestled for American Combat Wrestling (ACW), Uproar Pro Wrestling (UPW) and Coastal Championship Wrestling (CCW). 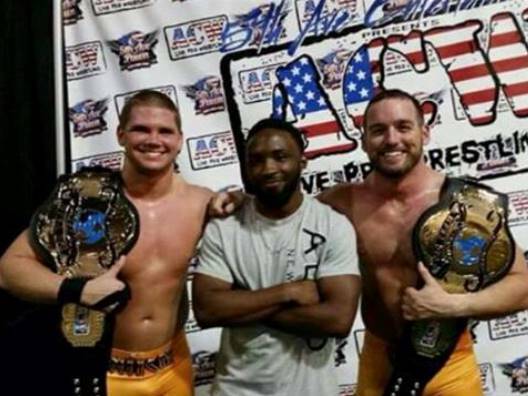 Generation Genesis is not exclusive to one promotion and the team also enjoyed success as holders of the ACW Tag Team Championship up until last month. This interview was completed on November 30, 2014. In this interview Mitchell and I focus on his work for NWA SPW. Daniel Johnson: To begin how would you describe yourself as a wrestler? Mitch Mitchell: Ambitious, hungry and grateful. Daniel Johnson: What first brought you to NWA FU? Mitch Mitchell: I was training with Brian Knobbs and Dontay Brown would stop in from time to time. When they all felt I was ready to go that is where I got started! Daniel Johnson: Wow, I didn’t know you trained with Brian Knobbs. Before I get more into your NWA FU work I was just curious what was it like training with Brian Knobbs? Mitch Mitchell: He was very big on mastering the basics and developing a good foundation. He was very critical because he wanted us to do things right. He would always break down film of our matches. He does not have the school anymore but we grew very close and I still talk to him often. He has also given me the opportunity to meet some people early in my career I never imagined getting to know. Daniel Johnson: Do you have any good stories about some of the more experienced wrestlers you have met? Mitch Mitchell: I was involved in a legends of wrestling show in Miami. I had a whole weekend to pick the brains of some of the best. Bret Hart, [Bill] Goldberg, [Ric] Flair, etc. Daniel Johnson: Getting into your NWA FU work in 2013 you had a long program with The Grease. What are your thoughts on this program and Grease as an opponent? Mitch Mitchell: It was a great way to break in. He was one of Knobbs’ students as well so we were very comfortable working together. Daniel Johnson: Correct me if I’m wrong, but I believe 2013 was also the first year you teamed with Jeff Boom for the first time. How did this team come about? Daniel Johnson: With Boom you went onto become known as Generation Genesis. Who came up with this name and what was the inspiration? Mitch Mitchell: We kind of came up with it together. We believe we are the future. We are the start of the next generation of tag team wrestling. Both young and hungry and ready to take over. Daniel Johnson: Also, in 2013 you had the chance to wrestle former TNA wrestler Jesse Sorensen. What are your memories of those matches? Mitch Mitchell: Jesse is another one of my good friends. He helped train me from when I first started over with Knobbs. It was nice to show him how far I had come in a short amount of time and I really enjoyed those matches! Daniel Johnson: Speaking of former TNA talent is TNA a place you could ever see yourself working? Is that a goal you have at all? Mitch Mitchell: If the opportunity presented itself, definitely. My real goal is to eventually go to the WWE. Daniel Johnson: These days you team with Boom a lot. Would you consider yourself a tag team specialist? Do you have any interest in working more as a singles performer? Mitch Mitchell: I still wrestle singles pretty often. We have been having a lot of fun though and as long as I’m doing what I love and enjoying it that’s all I care about. A tag team specialist…no. We are both very new to the game and learn a lot with every match. Just taking it all in like a sponge. We have had the opportunity to feud with some great teams lately. Daniel Johnson: Along the lines of working with Boom when do you feel you really started to gel as a team? Is there a match in particular that stands out for you? Mitch Mitchell: I don’t recall an exact match, but after a couple months there was a point when we noticed we were really starting to connect with the crowd and we knew it was something we could really run with. Daniel Johnson: Correct me if I’m wrong, but I believe this is the first year you have held gold as co-holder of the NWA FU Tag Team Championship with Jeff Bloom. What was the experience like of winning the titles? Mitch Mitchell: We honestly felt like it was a long time coming. It was great to finally get that nudge when it happened because we had worked our asses off to get there for close to a year. Daniel Johnson: You had these titles for 168 days. What did you think was the best match you had and what was your most memorable moment as champion? Mitch Mitchell: Our best match is hard to say. We had a good match in Miami against James Raideen and Mr. 450 and many great ones against Kennedy Kendrick and Deimos. Our most memorable would probably be the night we lost them against the Los Bendajos. Daniel Johnson: You mentioned working with James Raideen who is an international wrestler. What other international wrestlers have you worked with and do you have any stories about any you could share? Mitch Mitchell: Both guys in that match have wrestled around the world. A few other guys I’ve worked with have been on tours to Japan like Deimos. It is always good to see different styles and perspectives and take in as much as I can. Daniel Johnson: You mentioned him a little bit earlier, but I was wondering about Kennedy Kendrick who seems to travel all over the American southeast. What are your thoughts on Kendrick and your matches with him? Mitch Mitchell: Great guy I feel like we have had 40 matches and have another coming up December 20. We are always trying to do something different than the last time. Daniel Johnson: Getting more into the NWA SPW roster is there anyone in the company you have yet to wrestle that you would like to? What about other NWA talent outside of NWA SPW? Mitch Mitchell: I really hope to work with Bruce Santee soon. Wes Brisco as well because he was another guy who helped train me. Daniel Johnson: I also had some other questions I wanted to ask, but before I do is there anything else you wanted to say about NWA SPW? Mitch Mitchell: It has been a great platform to learn and develop close to home. Daniel Johnson: Cool. Moving on what is the furthest you have wrestled from home and what are your memories of that match? Mitch Mitchell: Miami is the furthest I have traveled, been there several times. I have had a good experience almost every time except when our car broke down on Alligator Alley. Daniel Johnson: Do you hope to wrestle more outside of Florida in the near future? If so then where to? Mitch Mitchell: I work a lot and never really get two days off where I can travel. If time permits I would love to go all around the country. Japan and Mexico would be nice too. Daniel Johnson: Awesome, any particular opponents in Japan or Mexico who you would like to face? Mitch Mitchell: Not really haha. Daniel Johnson: Moving on, looking to the future how would you like to see 2015 unfold for yourself? Mitch Mitchell: Just keep doing what I’m doing, Keep getting in better shape and improving every chance I get. I’d love for Generation Genesis to get a chance to see what they could do in NXT. Daniel Johnson: To end interviews I like to ask some non-wrestling questions then a few short wrestling questions. First, what is the last book you read and would you recommend it? Mitch Mitchell: Have a Nice Day[: A Tale of Blood and Sweatsocks] by Mick Foley. Hell yeah! Daniel Johnson: What has been your favorite movie to come out this year? Mitch Mitchell: Guardians of the Galaxy. Daniel Johnson: What do you like to watch on TV? Mitch Mitchell: “1000hp” by Godsmack. Daniel Johnson: Have you had any new foods for the first time this year? If so then what? Mitch Mitchell: Not that I can think of. Daniel Johnson: No problem, ending with some wrestling questions who is your dream opponent and why? Mitch Mitchell: [Randy] Orton he has been my favorite for a while. Daniel Johnson: Who is one wrestler 25 or under that you think readers should know about? Daniel Johnson: Haha, do you have any ribs or road stories you can share? Mitch Mitchell: [Jerry] Sags put my toothbrush in the toilet one time. Daniel Johnson: What if anything has been the weirdest part of working for NWA SPW? Mitch Mitchell: Weird? I’m not sure what you mean haha. Daniel Johnson: Just unusual or unexpected? Mitch Mitchell: I guess just the amount of guys who are coming and going all the time. Signature has changed a lot in the short time I have been there. Daniel Johnson: To end is there anything you would like to add? Mitch Mitchell: Not really I think we’ve covered everything pretty well.